Portland-based indie-folk artist Laura Veirs is currently working in the studio on her first record since 2011's kids music set Tumble Bee, and it looks as if she's got a few famous friends on board for the project as well. Namely, Canadian pop vet k.d. lang. A tweet from Veirs earlier today (March 19) confirmed, "The great k.d. lang sang on the record today!" and offered up even more proof via a picture of lang posing alongside Veirs and her producer/husband Tucker Martine at Portland's Flora Recording & Playback studio. Not much else has been revealed about the LP beyond that, but lang may not be the only guest star on Veirs' next set. The July Flame singer-songwriter posted earlier this year that she "will be wrangling friends into this." A due date for the new album has yet to be determined. 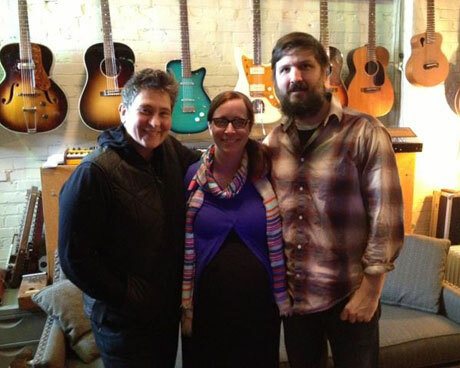 Veirs is also set to celebrate Record Store Day (April 20) with a free performance at Portland's Everyday Music, which may be the last show she plays for the next little while as she's due to have her second child with Martine the following week. Lang, meanwhile, has yet to follow up her 2011 set Sing It Loud.